This vivid and modern cake was based on the invitation to a baby shower. 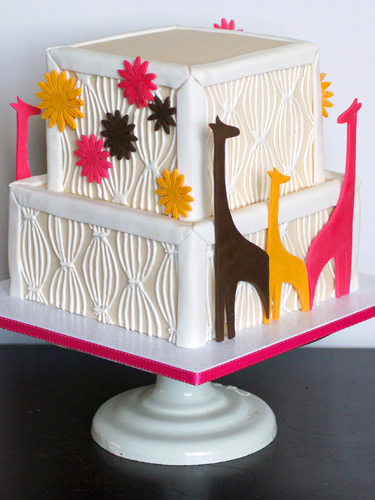 The cake resembles the invitations down to the background pattern.A brightly hued giraffe family nestle together on alternating sides. Colorful flowers were placed on the top tier to add balance to the ensemble as well. This is just another example of the careful and detail-oriented custom work we do here at Brooklyn Cake. This is also a great example of how a baby shower cake doesn’t need to follow the usual conventions of baby themes such as baby shoes, blocks or rattles. A cake such as this is a great way of adding style, simplicity and elegance to a baby-related event. It would work great even as a child’s birthday cake. You could dress up your event further by adding matching cupcakes, sugar cookies, French macarons or cake pops! Cutting the cake servings size down and adding other dessert options are a great way of increasing variety as well as upping the festiveness of your event. At Brooklyn Cake, we would also provide custom printed labels as well as other decor such as banners, custom patterned papers and wrappers and handmade crafts to dress up your presentation. Check out some of our other fabulous and non-conventional baby shower cakes such as the Candyland Cake and Pregnant Lady cakes.